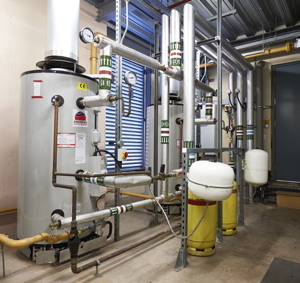 With new Ecodesign requirements under ErP coming into force this September, specifiers are under pressure to ensure that heating system upgrades are compliant. Dan Martindale argues that replacing existing atmospheric water heaters with new ultralow NOx models may be the easiest and most cost-effective way of meeting the new regulations. For specifiers, it can sometimes feel like there’s a never-ending stream of regulations to comply with. But with environmental issues risingup the political agenda, there is growing demand from customers for more efficient and sustainable heating solutions. Technological advances have paved the way for innovative design changes and manufacturers are continuously looking at ways to create greener heating products. However, with new technology hitting the market all the time, it can be a challenge for specifiers to keep up with the products, as well as the regulatory requirements. In September this year, the next phase of the EU’s Energyrelated Products Directive (ErP) will come into effect. The changes dictate maximum NOx emissions of 56mg/kWh for gas and liquefied petroleum gas (LPG) boilers and water heaters and 120mg/kWh for oil-fired boilers. This applies to new space heaters (including boilers) up to and including 400kW on both new build and replacement projects. The legislation follows tighter ErP energy efficiency requirements for space heating introduced in September 2015. 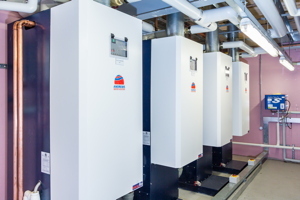 The aim is to ensure that only the most energy-efficient, low NOx heating products are manufactured, specified and installed across the UK and Europe. Worldwide recognition of the health dangers posed by air pollution has led the government to introduce new measures to reduce NOx emissions. According to the Department of Environment, Food and Rural Affairs (Defra), most UK cities and towns reached ‘high’ or ‘very high’ levels of pollution at some point last year. While road traffic is a major contributor to outdoor pollution, non-domestic buildings – and their heating – also typically emit NOx. So, reducing NOx emissions from heating is an important step towards achieving cleaner air. In fact, the government predicts a 20% reduction in energy consumption and emissions when replacing older equipment with ErP compliant products. Poor air quality has been linked to asthma and lung and heart-related conditions. Defra measures levels of five pollutants: ozone, nitrogen dioxide, sulphur dioxide, and PM2.5 as well as PM10 particulate matter. Of these, it claims that NOx alone is responsible for the premature death of 23,500 citizens each year in the UK. Conventional gas water heaters are a called atmospheric units because they require oxygen from the immediate atmosphere for the combustion process to heat up the water. This design allows it to extract at least 80 per cent of the heat generated by the gas to heat the water, but 15-20 per cent of the heat still escapes out the chimney unused. The workhorse of water heaters using time-tested technology and production, atmospheric water heaters have been around for decades. They are easy to install because venting is standard and relatively simple and are often the favoured option in older buildings because units simply require a chimney to exhaust or vent. Like conventional atmospheric heaters, condensing gas water heaters have a tank. But that’s where the similarity ends. Instead of sending hot exhaust gases out of the flue, condensing products utilise a heat exchangerdesign that is capable of capturing and using most of the latent heat produced by the water vapour within the flue gases. This reduces the exhaust flue gas temperature and increases the overall efficiency of the product. The obvious issue with atmospheric water heaters is that they aren’t as efficient as condensing alternatives at using the fuel they burn - and this directly impacts an organisation’s energy bills. Decisions about what type of water heater to opt for is likely to come down to individual use cases. But worries about compliance with the new NOx regulations should not be dictating the choice. Although some manufacturers are touting condensing boilers and water heaters as the only way to comply, this is simply not true. Condensing water heaters can maximise efficiency levels but for properties with an existing stock of atmospheric water heaters, a like-for-like replacement is the quickest and easiest way of meeting the forthcoming round of Ecodesign requirements. New ErP compliant atmospheric water heaters feature an ultra-low NOx burner that plays the same role in reducing emissions as the premixed burners found in condensing boilers. Moving to a condensing system often involves the replacement of flue systems, considerable pipework alterations and the subsequent work can result in longer down time for business. Therefore, by upgrading to an ErP compliant atmospheric water heater, existing users can save time, money and hassle. With just over four months to go until the low NOx levels become mandatory, specifiers and building managers are under pressure to review their current systems. However, they need not panic that they’ll have to carry out a massive upgrade before September. The prospect of complying with another round of ErP changes may seem daunting but with today’s water heaters, the requirements are easily achievable. New atmospheric water heaters can provide a quick fix for businesses without having to embark on a large-scale transformation project to a condensing system. What’s more, it will result in a cleaner environment, bigger energy savings and reduced emissions for all.